We felt rough. In an attempt to ease our nerves about the upcoming section Tenny capitalized on the friendly postman behind the counter at the Post Office. Please, can you give us some info? He lived in the area and provided a calm and encouraging picture about what was ahead. Carlin put our fears temporarily to rest simply by talking about his little farm near Sierra Blanca. Border Patrol stopped him the other day because he left footprints around his property line, he was building a wall around the perimeter. He added, “I’m not certain whether I’m building it to keep people in or out.” The wheelbarrow he was pushing at the time had left a track and it confused the agent so he had to explain what the tracks were. Carlin said BP has a headquarters in Sierra Blanca which possibly explains why the BP yesterday evening didn't know much about Fort Hancock and beyond, it’s not their district. Okay were already feeling better, bye Carlin! Normally the landscape has our full attention but today we just couldn't focus. Tractors were out turning the soil and the land was open and well cared for but our thoughts and conversation revolved around who to contact next. Colin McDonald, who hiked this section on his Rio Grande source to sea trip, was at the top of our list. Colin is at the top of all our lists, he is the best and as a fellow hiker has uniquely helpful info. So while we walked he shared a list of names to contact in the area, what the upcoming terrain looked like and the water situation, that yes this was a high activity area, but that we could do it. After we said goodbye he followed up by sending more than a handful of phone numbers along. Perfect, we’ll give some folks a call. Next up was John, our guardian angel friend from the beginning of the trip. A friend from back in San Diego is as important as a contact ahead. John always boosts our faith and he did no less today. 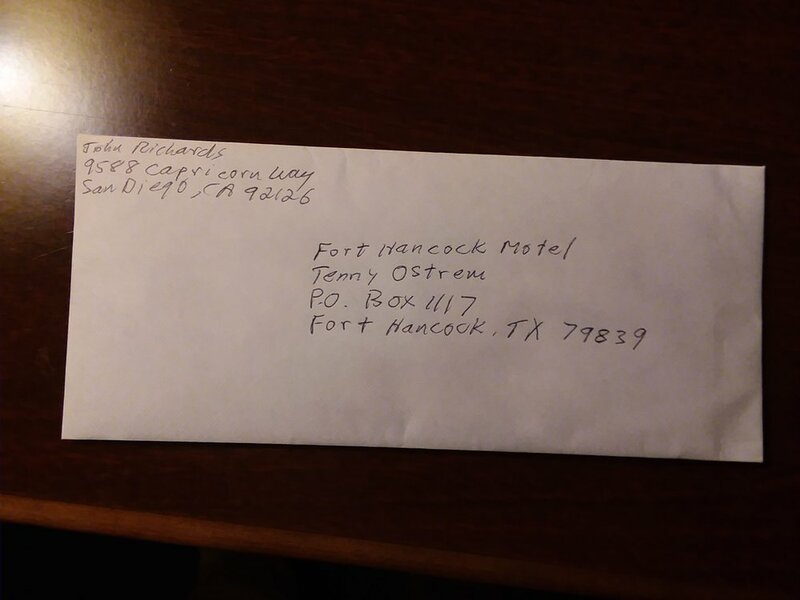 Plus we had received a letter from him this very morning! We only put in a couple hours of hiking today but it took us a while to catch a ride. 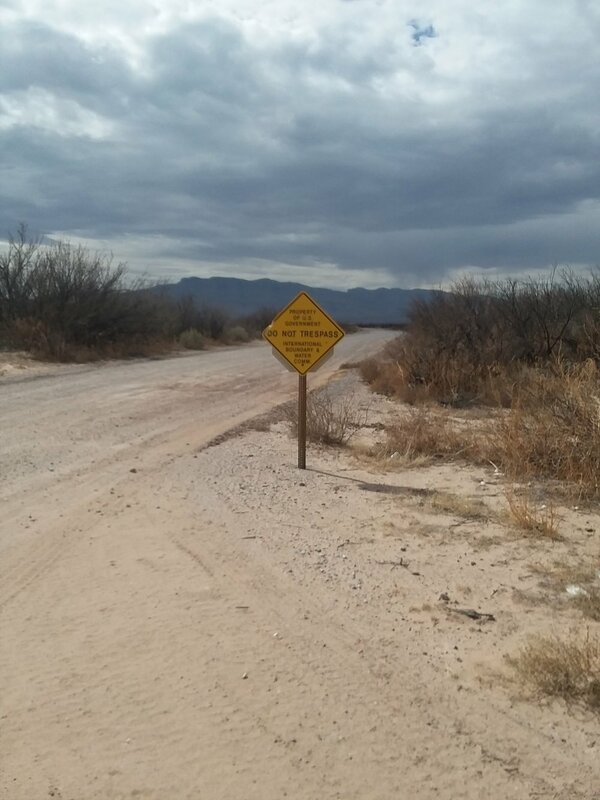 It’s not exactly surprising since we looked extremely sketchy standing in a completely random spot along a country road only a mile from the border. It’s no wonder we keep having Border Patrol called on us. After a lot of disappointments, a local kid from Fort Hancock helped us out. We tried to speak Spanish but mostly ended up using Google Translate. Damn it. Back at the hotel we started down the list of contacts Colin provided. The Conservation and Reclamation Dept, a prominent farmer in Fort Hancock, a landowner down near the Quitman Mountains, a river guide and on and on. Some people we reached, others we left voicemails. Incredibly, one guy, Danny Chavez returned our voicemail with an in person visit. He showed up at our hotel ten minutes after we reached him on the phone. Wow. 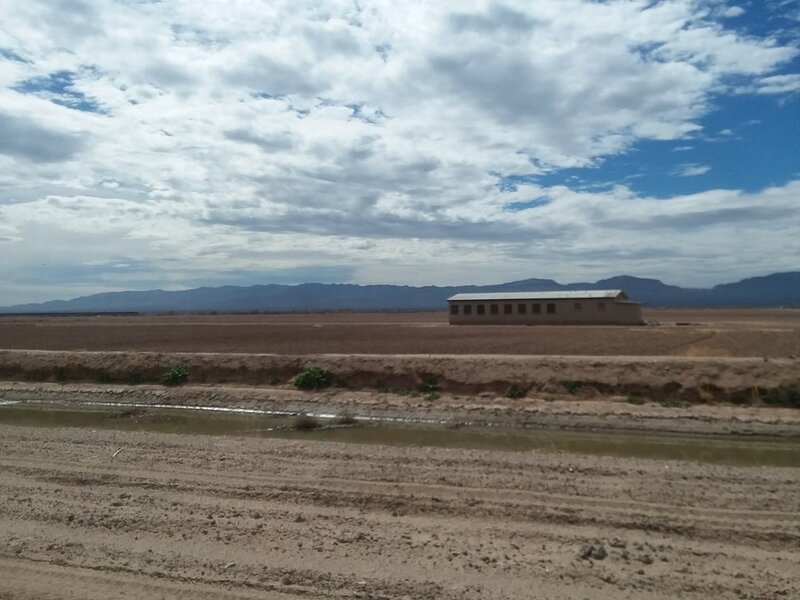 Danny works for the Conservation and Reclamation Department, which maintains Hudspeth County’s irrigation systems. His territory begins at the northernmost county line and extends past Esperanza. To him this is “God’s Country.” Maybe in a religious sense, or maybe just because it’s big and beautiful. Whichever way, we like that. As usual we don’t have enough time for all our questions and our curiosity bursts forth, unchecked. We ask him to tell us more about the canals. The water is from the Rio Grande and irrigates all the farms in the area, as well as about 25,000 acres in Mexico. The canals end and the “river” begins at the same point that Danny’s care for the waterways becomes the responsibility of the International Boundary Water Commission. Cool job. Danny knew just about every old ranching family from here to our next destination. The Miller brothers, the Carr family, the Lopezes, the Paradas, the Neelys, Talleys. He’s married to a woman from the area (he grew up nearby in El Paso) and is an inlaw to some of the important ranching families. He offered to drive us over to meet one of the Millers immediately. Lester Miller and his brother Wayne own a big chunk of land in a section we’ll be moving through and we’re happy to make Lester’s acquaintance, as well as his relative Craig (we’re a bit unclear on the complicated family tree). We caught them at the end of their workday but they were nice enough to chat with us and provide some details on the route we would be taking. Lester gave us permission to fill up on water at his ranch and gave us some more contacts to call. They were both somewhat skeptical of what we were attempting to do, asking us if we were carrying guns and encouraging us to take the bus instead. This seems to be a common reaction from the people we’ve been meeting and we’re not sure how much we should listen. We have a lot of respect for their knowledge and perspective but we’ve also been constantly underestimated on this trip. Yes, we contribute towards this by prioritizing being agreeable to being assertive but at the end of the day we’re women and the basic assumption is that we’re naive and vulnerable. It’s frustrating. They did tell us about an old woman who used to live way in the backcountry and famously traveled around on a burro. She made it work. Last call of the day was to Robert Newman, a retired Game Warden and currently a county deputy. It was nerve racking to present our “crazy” idea to him. Fortunately he took us seriously while cushioning his severity with a dry sense of humor. He knew everything about anything from here to 200 miles east of Fort Hancock. It's impossible to summarize everything he imparted but it was extremely helpful. Thanks Robert!